Our one bedroom upstairs Hale has a private entrance with patio and bbq area...The newly tiled Kitchen is inside and screened so you can sit and have your meals or coffee in the beauty of the Mango's and Palms. The kitchen is complete with all dishes, cookware, silverware, towels & linens.. Private large full bathroom with new tile. The main room has Queen size bed, rattan chairs and tables, Wood vaulted ceiling with large fan, Digital TV and WiFi Internet...Private gated drive, very secure 1 acre property. Snorkel gear, boogie board, beach chairs and towels are included. 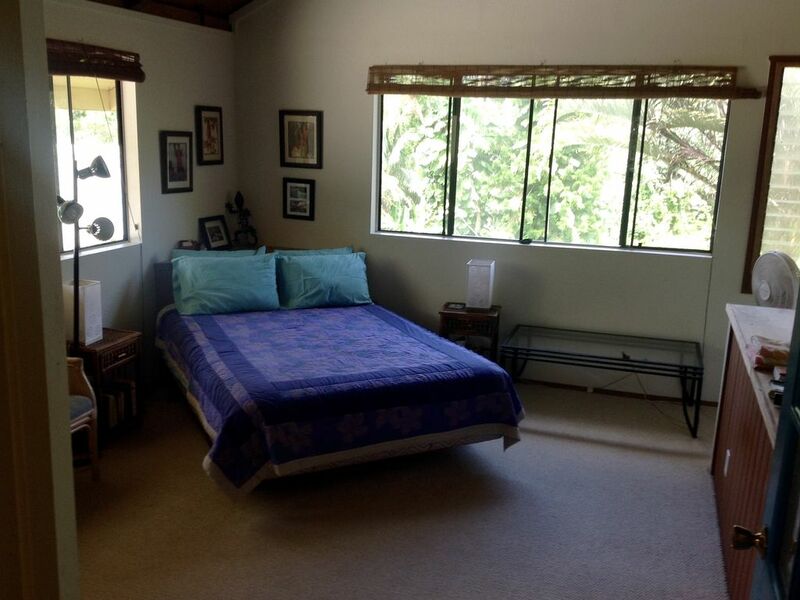 One mile from the ocean, and two miles from the main highway, Site offers easy access to east side highlights--20 minutes from Ahalanui Beach Park (a naturally warmed 95 degree seawater pond), 35 minutes from Volcano National Park, 20 minutes from Hilo airport, 10 minutes from Keaau town, and 10 minutes from Pahoa Village. It was a nice couple of evenings at the Lizard Lodge. We knew ahead to expect some night noises from the rain forest( chirping frogs all night !) making for an unusual and interesting experience. Beautiful location. Decent amenities, bird and frog sounds are very loud at night, but that's part of the experience! A nice place for a vacation base. All our needs were met. Lovely flora surrounding house and it's not called the lizard house for nothing. Beautiful oceanside spot just like 5 minutes that we visited many times, at night too to stargaze. The place was a perfect spot. Open and airy. The grounds are beautiful. Would stay again and recommend you should too! The tropical lizard house was great. Hosts were kind and welcoming. Clean and cozy! What great guests, Would love have them back anytime..